Maruti Suzuki is going to launch a slew of new model updates within this fiscal year and the next. 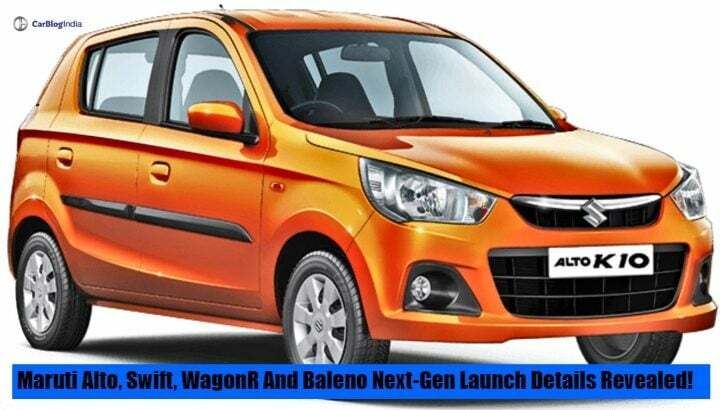 Alto, Swift, WagonR and Baleno to all get updates soon. We are all well aware that Maruti Suzuki is currently working on an update for some of its largest selling hatchbacks in India. The Alto, WagonR, Swift and the Baleno, of which the Swift recieved its third generation update in February, are all lined up for an update in the near future. But when are they going to launch? Well, according to a recent media report, the details regarding the launch of the next-generation iterations as well as the minor facelifts of the above-mentioned models have been leaked. The Alto has been the largest selling car in India since a very long time. It continues to rule the entry-level hatchback segment despite the launch of several new models which tend to offer better feature and a better aesthetic package. There were rising speculations about Maruti updating the Alto in accordance with the industry and buyer trends. However, nothing concrete was coming out as of now. Maruti Suzuki will launch a minor update for the Alto hatchback in India during the March 2019. Furthermore, the company will launch a full-fledged generation update of this entry-level hatchback sometime during the next fiscal. The launch is likely to happen during the year 2020. The leaked information suggests that Maruti is going to start the production of the next-generation WagonR in India during the month of November 2018. Earlier it was supposed to begin in September but the automaker has decided otherwise. Maruti will continue to manufacture the commercial version of the Wagon R in India post-November as well. The next-generation Maruti Suzuki Wagon R will launch in India during the first quarter of 2019. As mentioned before, the Maruti Swift had just recieved its third generation update in India during the month of February 2018. New information suggests that this premium compact hatchback will receive a mid-cycle refresh in the next fiscal. While the complete generation update is due for the year 2020. The Baleno quickly rose to the top step of the podium in the premium hatchback segment. Launched in the year 2016, this car has so far garnered more than 4 lakh sales in our country. With the competition getting updates and mid-cycle refreshes, it is time that Maruti Suzuki also updates the Baleno. Hence, it seems believable that the company is going to lunch a facelift of the Baleno in India sometime during the next fiscal, alongside the Swift. That’s these four cars summed up then. What about other new model launches from Maruti? The Indo-Japanese automaker has just launched the mid-cycle facelift for the Ciaz sedan in India. It is expected to launch the next-generation Maruti Ertiga sometime during the latter half of October. Other than this, it is working on an electric variant for the Wagon R which the company plans to launch in 2020. Other than this, there is Future Concept based Micro-SUV in the macking as well which is likely to make its debut during the second half of 2019.